Fourteen years ago, I was a PhD student somewhere half-way through my degree and had just published my first paper. As I proudly flicked through the hard copy of the journal, I noticed another article that caught my interest. Using DNA extracted from ancient bones, an international team lead by researchers from Oxford University and Palaecol Research in Christchurch had managed to reconstruct the DNA sequence of a small fragment of the legendary Haast’s eagle’s mitochondrial genome. With a weight of approximately 15 kg and a wingspan of close to three meters, the extinct New Zealand Haast’s eagle is the largest known eagle to have ever lived. By comparing the Haast’s eagle’s DNA fragment to the same fragment from other eagles, the authors had expected to confirm that the New Zealand giant was a remote cousin of the Australian wedge-tailed eagle, the largest Australian bird of prey. What they found, however, was far more fascinating. The Haast’s eagle was only very remotely related to the wedge-tailed eagle, though the authors did identify a much closer Australian relative: The little eagle, one of the smallest eagles in the world. Curiously, at least for the small fragment of DNA analysed in the study, the tiny Aussie and giant New Zealand bird were so similar they could have shared a common ancestor less than 1.8 million years ago. On an evolutionary timescale, that is essentially yesterday. 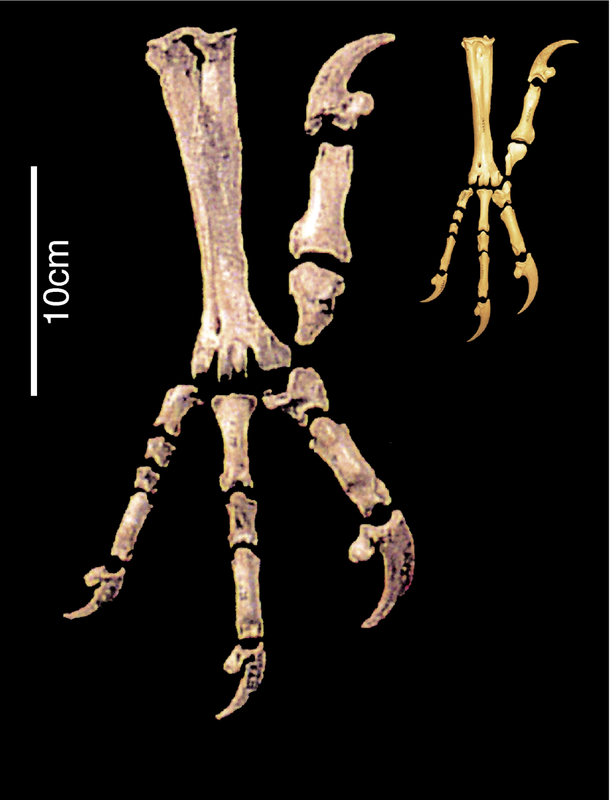 Comparison of the huge claws of Harpagornis moorei with those of its close relative the Hieraaetus morphnoides, the “little” eagle. Bunce M, Szulkin M, Lerner HRL, Barnes I, Shapiro B, et al. : Ancient DNA Provides New Insights into the Evolutionary History of New Zealand’s Extinct Giant Eagle. PLoS Biol 3/1/2005: e9. For comparison, we can look at our own evolution. About 1.8 million years ago, our ancestor Homo erectus appears in the fossil record. To a lay person, the skeleton of a Homo erectus looks very similar to our own skeleton, with some minor differences in skull shape and a slightly smaller brain. So, in the same time that humans managed to increase their brain size by the equivalent of a small glass of wine, the ancestors of Haast’s eagle increased their body size 15 times! That is comparable to humans growing to the size of a rhino (or the size of a VW Polo, if you are less zoologically inclined). The evolution of New Zealand’s giant birds of prey has fascinated me ever since, and rapid improvements in DNA sequencing technology have recently allowed us to pick up the project where the Oxford study left off. Critically, new sequencing technology not only allowed us to re-analyse the relationships of Haast’s eagle and its Australian relatives using significantly more DNA sequence data. It also provided us with the very first molecular insights into the evolution of New Zealand’s second giant raptor, the far less well known, golden-eagle-sized Eyles’ harrier. For Haast’s eagle, our analyses essentially confirmed the Oxford study, although the additional data pushed the common ancestor of little eagle and Haast’s eagles back to about 2.5 million years ago. The most surprising result from our study related to the Eyles’ harrier, though. The rapid evolution of island gigantism in Haast’s eagle seemed extraordinary, and we certainly did not expect to find another example of such rapid change in size. Yet, we found the same story for Eyles’ harrier. In fact, the genetic divergence between the Eyles’ harrier and its newly identified closest relative, the medium size Australian spotted harrier, was exactly the same as the divergence between the eagles. While the size difference in the case of the harrier was “only” sixfold, from a 0.5 kg Aussie to the 3kg New Zealand bird with a two-metre wingspan, in some ways the Eyles’ harrier gigantism is even more impressive than that of Haast’s eagle. While Haast’s eagle is only about 50 per cent larger than the second largest known eagle, Eyles’ harrier was roughly three times the size of the second largest harrier in the world, the Australasian swamp harrier. So, what is it about New Zealand that turns tiny birds of prey into monsters? We believe that, for birds of prey, it is the fact that they are climbing up the food chain once they arrive in New Zealand. On most other landmasses, the top predators are mammals, like wolfs of lions. In the case of Australia, it was the marsupial lion that sat at the top of the food chain. In these regions, birds of prey usually target smaller animals, not the largest herbivores around. In New Zealand however, there were no native land mammals other than two species of bats. 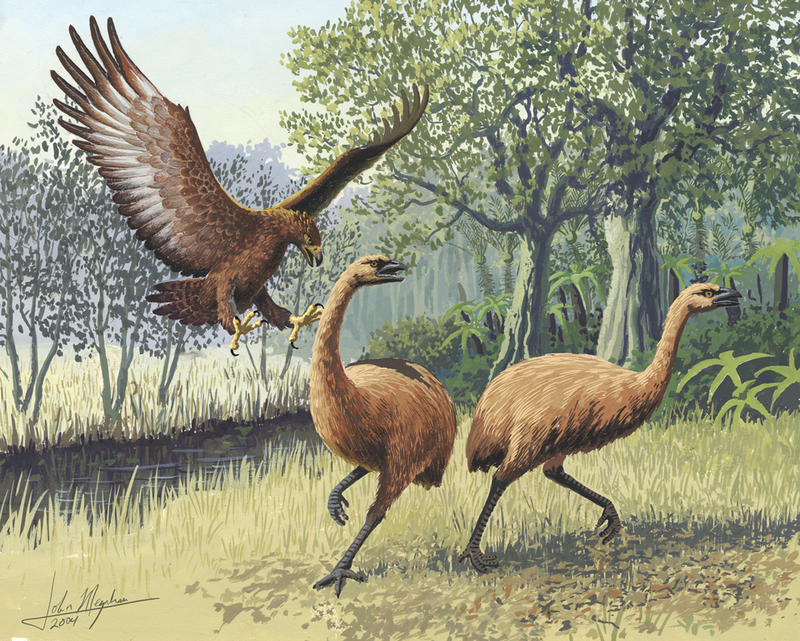 There was nothing that preyed on the large birds like the multiple species of moa that called New Zealand their home. Therefore, being able to kill larger prey was a selective advantage for birds of prey. There was simply more food available in the “large” size range, than among smaller animals that were already preyed upon by other species. Therefore, the bigger an individual eagle or harrier was, the better its chances to kill larger prey and the better its chances to look big and healthy when it came to finding a partner. Every generation, the biggest eagles and harriers would produce more offspring than the smaller individuals, and, over a period of two million years, this selection produced the now iconic giant raptors that soared over New Zealand’s landscapes until a few hundred years ago. Dr Michael Knapp is a senior lecturer in Biological Anthropology at the University of Otago – this research was supported by a Rutherford Discovery Fellowship from the Royal Society Te Apārangi. Featured image: John Megahan – PLoS Biol 3(1): e20.